The police have been generous. I’ve been writing and researching my book for about three years now. I’ve been doing research from the start, but my graduate advisor, the very kind and scarily smart Amy Benson, recently pointed out that I could have written this book without it. It took me a day or so to understand that, yes, actually, I could have done it: stuck closely to my own experience, bolstering my memory with only a few questions to family members, a few Google searches to make sure this street does cross that street, doesn’t run parallel. But this story – of my mother’s life, her murder in 1994, and the eventual discovery of the killer – is bigger than me. And because it’s bigger than me, I’m compelled to get my arms around all of it, to hold and own everything about it. I also admit I’m in a wrestling match with this story, this thing that’s been holding me down. And it’s important to know your opponent. Impulse-highlight: Benny & Joon, one of my all-time favorites. But I hadn’t realized I’d first seen it with Mom, in those final weeks. So my computer holds about 40 hours of audiotape – my voice braided with the voices of family, of ex-fiancés, of acquaintances and officials. And those generous police, aided by the District Attorney’s office, have helped me acquire thousands of pages from their files. I have grainy photocopies of handwritten notes from interviews. Typed observations about this man or that man’s strange behavior. The transcript from our answering machine. Autopsy reports. The clinician’s notes from a handful of visits Mom made to a counselor. 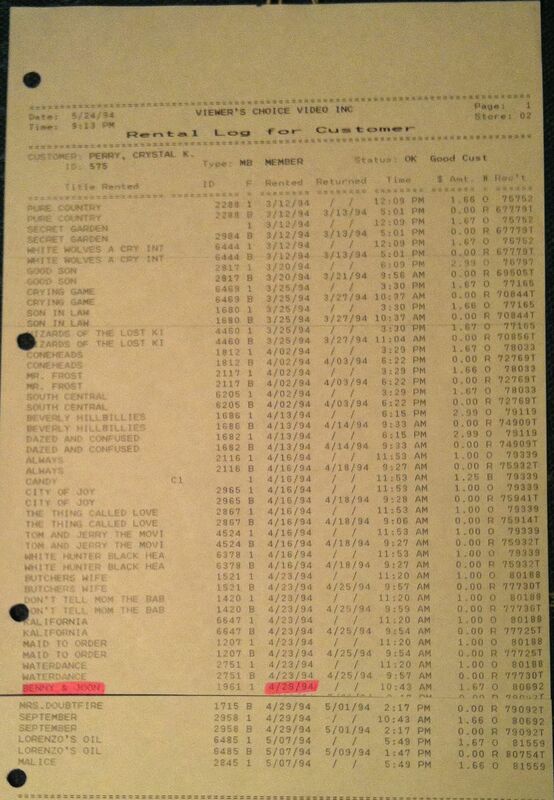 A print-out from the movie rental store in our small town – a dusty, red-roofed place that had been a Dairy Queen when I was very small – showing the last dozen or so movies my mother and I watched together. When I visited the Maine State police barracks to acquire these documents, the only things I didn’t take were the crime scene photographs. I knew I’d end up sitting in my room late at night, coming up with some writing-process excuse to examine them, to face them down in the darkness and solitude of 1 a.m. Some things aren’t necessary. I’ve seen them several times and that’s enough. On my way home to New York, I coasted off the highway somewhere in Connecticut to sleep. I pulled the big cardboard box holding those photocopies out of my trunk, fearful of theft. I put them next to the bed in the bizarre motel I’d chosen from among the cheapest places on a strip of four-lane road lined with the high, white lights of car dealerships. The motel consisted of small, vinyl-sided buildings, two rooms per building, strung along a semicircular driveway that arced back away from the road into the dark. I was far from the office, where the late-night attendant actually was an unshaven, sweaty man smoking a cigar. I teetered on the edge of sleep for a long time, finally giving in with a chain of bubbling giggles, thinking of bizarre headlines related to my hypothetical killing later that night: Young Murder Researcher Murdered on the Job. Sometimes absurdity is the only refuge from fear. Movies are important in a town of 2,500. 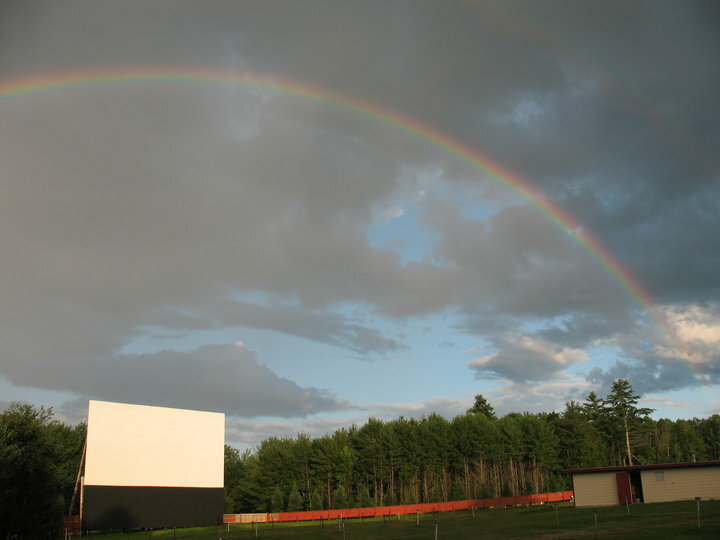 In summer, we hit the drive-in. It was the late 1990s before I realized drive-ins are rare. The best memoirs, like Nabokov’s Speak, Memory or Mary Karr’s The Liar’s Club or Studiola visitor Lidia Yuknavitch’s The Chronology of Water, layer time and memory so that their texts resemble the actual experience of being a conscious human. The present self speaks to and for the past self, sometimes holding her close, sometimes shaking her at arm’s length. It’s alchemy, it’s a magic trick, it’s something I am desperately trying to pull off in my book. But what happens when creating such a book is the guiding principle of your present life? When you gather evidence of specific past moments that otherwise might only come to you in dreams? What’s interesting to me lately is that while writing a memoir, no matter what the text might look like, one’s actual life takes on this layering. The past isn’t just vaporous memory in the head but documents and other objects, ballast that you have to carry carefully so it doesn’t capsize you.